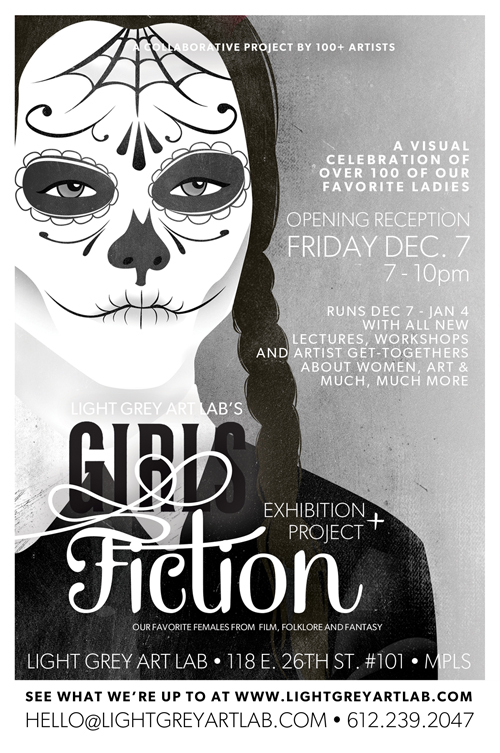 LIGHT GREY ART LAB: Girls: Fact + Fiction Opening Reception! Girls: Fact + Fiction Opening Reception! Our upcoming show, Girls: Fact + Fiction, is shaping up to be an amazing treat! Curated by Light Grey Art Lab's own Lindsay Nohl, Francesca Buchko, Chris Hajny and Jenny Bookler, Girls: Fact + Fiction is a spectacular new exhibition that celebrates women from history, literature, film, music, culture, politics... and everything else! The opening reception is December 7th from 7-10 PM. The gallery will be divided into two collections, Fact and Fiction! We've asked artists to write short statements about what inspired them to choose who they chose, so come in, see your some of your favorite characters, pop-culture icons, and historic figures (and more) and learn about some you've never heard of! This will also be your first chance to get your hands on the Girls: Fact + Fiction book! The book is on it's way from the printer as we speak, and it's beautiful to behold, if I may say so myself! Easiest Christmas shopping you'll ever do! You'll definitely want to attend the opening reception, as in addition to food, drink, music and art, we'll be giving away some some artwork form the show as well copies of the Girls: Fact + Fiction book! And stay-tuned for more events relating to the Girls: Fact + Fiction show! We'll have workshops, interesting lectures and an artist meet-and-greet event! More information to come! Remember, the Opening Reception is Friday, December 7th from 7- 10pm! We're located on the corner of Stevens Ave and 26th Street - right across from the Minneapolis College of Art & Design. Street parking is available on Stevens, 26th and 1st Ave.
Hey Friends, You will be glad to know that here we are going to provide you the best website for free mozilla firefox download and this web browser is so smooth for working. This browser is of latest technology having advanced features and setting which not only make your work easier but also increases your knowledge. Try out this web browser for once. This is very best post to read..